Seattle, long known for great coffee and cloudy days, has added a new distinction -- bikeshare hotbed. There are more bikes available, and more rides being taken. The price of a single ride -- $1 -- isn't only cheaper -- it's the lowest price of any bikeshare system in a major U.S. city. The city government will be receiving substantially more data on these bike trips, to better plan local transportation. By year's end, Seattle is on pace to have the U.S.'s largest bikeshare network. And all of this happened without a penny of taxpayer funding. "The city has turned what was an abysmal failure into a huge success story just within a matter of months," Tom Fucoloro, editor of the Seattle Bike Blog, told CNN. "Seattle is the gateway to the U.S. on bikeshare. A lot of other cities are looking at Seattle and watching." 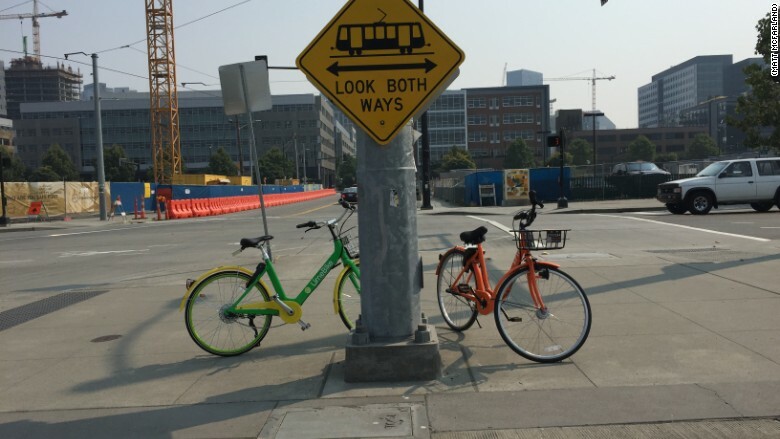 Several LimeBikes are parked alongside a bikelane in Seattle. Seattle's success can be traced to good fortune on timing, and a clever permitting system. This summer it became one of the first cities to issue a permit for private bikeshare systems that do not use stations or docks to park bicycles. Instead, bikes can be left along public sidewalks, provided they do not block driveways or pedestrian access. This is more convenient for riders, and widely seen as the future of bikeshare. Bicycles can be located via a smartphone app. A lock on the rear wheel is unlocked when a rider scans a QR code on the bicycle. "Would you prefer to use Uber, which can pick you up at any location? Or would you prefer to go to a bus station, which only has 20 or 30 locations," LimeBike CEO Toby Sun, whose company launched in Seattle in late July, told CNN. 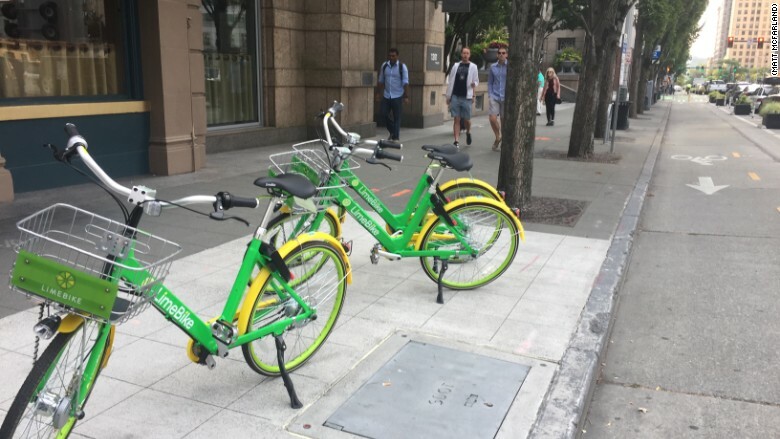 As Seattle was winding down its failed system, LimeBike and its competitor Spin were raising funding from Silicon Valley and looking for cities to launch in. Seattle, with a young, active population, a network of bike lanes and a sudden bikeshare vacuum, was an obvious candidate. Seattle's department of transportation, wary of its past failure, took a careful approach to the new entrants. Its permit allows stationless bikeshare companies to launch with only 500 bikes in their first month. If the first month goes well, companies can double to 1,000 bikes a month later, and then 2,000 bikes in another four weeks. The department has been pleased with LimeBike and Spin, and is allowing both to double their bike fleet size in September. 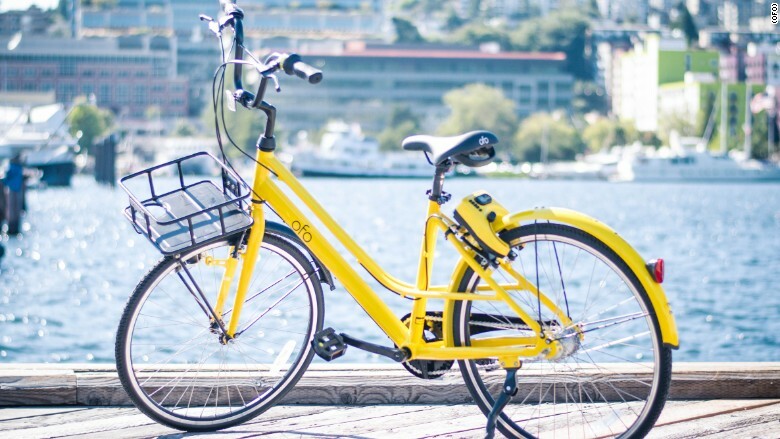 Ofo, a Chinese bikeshare company, launched in Seattle Thursday. Ofo riders take 25 million trips a day in 170 cities. The phased approach is a response to concerns about stationless bikeshare companies in China. The country is home to the world's fastest growing bikeshare companies. One of them, ofo, now has eight million bikes, and 150 million users. Riders take 25 million trips a day. It launched in Seattle Thursday, offering 60-minute rides for only a dollar. The downside of China's explosive growth is piles of unused bikes stacking up in some cities. So far, Seattle has prevented that on its own streets. Spin has 20 people monitoring its bikes in Seattle, and Ko said the team will grow. Ofo CEO Dai Wei told CNN the company wouldn't rush its rollout in Seattle. It's waiting to see how strong demand is. "When you think about thousands of bikes on a street, and people can finish their ride and place it almost anywhere — surprisingly it has not been that bad," Seattle Department of Transportation communications director Mafara Hobson told CNN. "Instead of letting new technologies come in and infiltrate the city, where we have to bend to how these companies work, we're trying to get in front of the technology instead." Many transportation experts lament how ridesharing networks, such as Uber and Lyft, arrived in cities. The companies moved quickly into cities, winning over consumers and leaving local governments with little leverage to make demands. Now these cities have scant data about the impact of ridesharing vehicles on their roads. This makes it challenging for governments to plan transportation and serve citizens. Seattle isn't making that mistake with bikes. The three companies, LimeBike, Spin and ofo, all include a GPS in their bicycles. They know where trips start and end, and exactly where cyclists like to ride in the city. In a unique arrangement, the companies and Seattle's city government have agreed to let the University of Washington store the data, and anonymize it so user privacy is protected. Shared bicycles from LimeBike and Spin are parked in Seattle's Lake Union neighborhood. Seattle's government wants to understand where people are riding. That way it knows if it's putting bike lanes in the most sensible locations, and if more or fewer bikes are needed. But there's danger too in data. With four location data points, 95% of the population can be identified. Riding a bike parked outside your home to immediately outside your workplace is a likely indicator of who you are. The university's Transportation Data Collaborative has been tasked with making sure privacy is protected. Unlike the city government, the university should be safe from freedom of information requests, which would risk user privacy. "This is a win-win and should help set a precedent for a lot of cities to follow," said Derrick Ko, CEO of Spin, who envisions expanding to 10,000 bikes in the city.